Here is an unusual tuber, modelled by Catherine in the Round Garden. 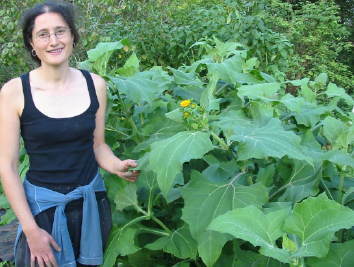 Yacon is a large plant from South America, distantly related to sunflowers, and it has huge, attractive fuzzy green leaves. It has very pretty little yellow flowers at the top of each stalk. The plants are very easy to grow and seem to thrive in almost any soil or climate. Underground, it grows a bit like a dahlia - with a small clump of knobbly growing tips, and large storage tubers radiating out in a circle. At the end of the season you dig it all up and the storage tubers are the bit you eat - they are really sweet and crunchy. The knobbly growing tips you divide and replant, so you don't need to keep buying it. The sweet storage tubers are peeled before use - and nice two ways: raw in salads, and stir fried as a substitute for water-chestnut. The tubers store very well and its a very welcome addition to our winter salads. A final interesting point about Yacon is that the type of sugar in the tubers is inulin - the same as in Jerusalem Artichokes - and for which most people don't have a digestive enzyme - so it has almost no calorific value whatsoever, despite its sweetness. 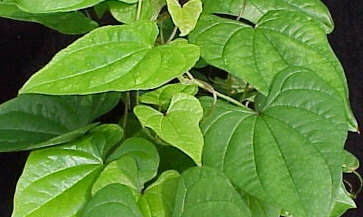 The plant makes a lumpy mass of growing tips at the bottom of the stem. We cut these apart, and post them out packed in a small handful of compost. Each yacon set will be a lump of root, maybe about 1 cm square, maybe a bit bigger, with a growing tip on it. As soon as you receive them - RIGHT AWAY - you put these in small pots with nice, slightly damp compost. They will make roots and once they are a bit bigger, after all danger of frost is past - you can plant them out in the garden. We are selling you 1 yacon. But we actually send you 3 growing tips to be sure of success, and in fact we expect on average, that 2 of these will grow. We will replace or refund if you do not get 1 surviving plant from the 3 tips, as long as you plant them in a pot as soon as you get them. For future years you should not need to purchase again as you can divide each plant yourself in the same way to give 3 to 7 new plants each time! YACON AVAILABILTY? Late autumn to early spring only. But enter your details & we'll email you when the new crop is harvested. Your details will then be deleted and not used for anything else. 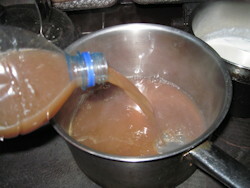 The folks at Brithdir have been also growing Yacon for a while and they've pointed out that you can also mash and press your yacon tubers to get juice, which can then be boiled down to a nice sweet syrup like maple syrup. 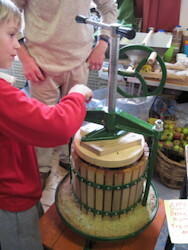 Here's Josie's friend Finn pressing the yacon at our local green fair (using a normal apple press), and then you can see the syrup we made by boiling it on our Rayburn for a while. We had some on waffles that evening and it was great. This is a nice unusual edible , but grown more for amusement rather than as a staple part of your diet. Our favourite thing about it is the incredible cinnamon scent that fills the air when it is flowering. The plants make 2 types of tuber - a huge underground one that is impossible to dig up, and small 'air-tubers' attached to the stem at the base of each leaf. It requires very little maintenance - the top growth dies back in winter but then resprouts in spring. They also have hundreds of small white flowers, which give off an intense cinnamon scent, fantastic in your polytunnel. On receipt, either start the bulbils in a small pot, or plant them into a well manured weed free site, somewhere you can give them a support to climb. Be patient - bulbils may take some time to sprout in their first year. Plants take 3-4 years to reach full maturity - the big edible root can then be up to 3 foot long, going straight down vertically. Digging it up is an interesting challenge! (Some people have suggested hiring a JCB digger and they might have a point). More helpfully, other gardeners grow them in deep tubs, stacks of old tyres or similar, and this is probably a more sensible approach if you aren't very, very fond of digging. Not very hardy overwinter. Can maybe try outside in the South East of the UK once established (start in a pot), but probably only for growing in a polytunnel in the rest of the country. One of the 'Lost Crops' of the Incas, this is a wonderful plant still widely grown in Bolivia & Peru. Oca is planted and cooked just like potatoes (although they are smaller, the size of new potatoes) and it has a lemony taste like potatoes with lemon butter. It's is easy as long as you have a moderately long season, and being completely unrelated to potatoes it's not affected by blight. And the lush green foliage with yellow flowers is actually rather pretty in its own right. Very few pests seem to like it, so its a real 'no work' crop. The tubers start to form in mid November, so if you have early frosts this is NOT for you. On the other hand, if the autumn is mild you should get a big crop of surprisingly large tubers. We get about 1/2 a kilo of Oca from each tuber planted. We have grown it successfully for years: both in Cambridge and on the west coast of Wales, but we don't know how it would fare further north. It is very easy to multiply up - you just keep a few tubers back for replanting. So if you like it you don't need to buy it each year but just replant your own. More details on storage and cooking included with your tubers. These are little seed tubers, it's like planting seed potatoes, but smaller. if you like them, you can then keep your own stock for future years - you won't need to buy them again. but if they are very small we will put more in to make it up to a minimum weight. For a notification when the oca is available to order, send us your email address using the form below. Mid winter to early spring only. This red oca has a small amount of black pigment outlining each 'eye' on the tuber, which is quite subtle but has a striking effect. It was sent to us by Cath Hillman in Surrey, who is originally from New Zealand and is always one of our most productive varieties. There's an interesting story in this - in the 1970's and 1980's the NZ goverment decided to research unusual plants that would grow there and could be high-value export crops. They did find and breed several things with varying success- you will probably know the Kiwi Fruit which was good, but also the (rather less tasty!) Kiwano Horned Melon. However, few people outside NZ know they also had a government-funded oca research programme. Like us, they tried to breed new varieties from seed (oca seed is very rare). It was quite sucessful, and although not exported (we don't know why) oca are commonly sold in supermarkets in NZ, though they are just called 'Yams' by the New Zealanders. Back to our story, Cath liked them very much, so when she found herself living in the UK she missed having them to eat. She eventually got hold of some from a NZ supermarket and grew them in Surrey, where they did just fine. And she later sent us some of hers to swap for our others; they did well for us and we have been bulking them up ever since. A strain that makes beautiful orange tubers with swirly scarlet outlines over the eyes. This is one of the first varieties that we grew, and we still think it's really good. Interestingly, with this variety, the shade of orange varies each year, we think that different weather makes them come out lighter or darker. This is a beautiful new variety we selected ourselves, originally from a sport of the Scarlet and White Oca. 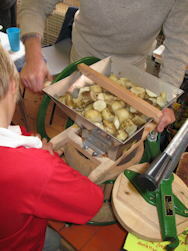 Since then we've selected for bigger tubers and higher yields. It's unusal among the multi-coloured oca as this one has large amounts of both colours on the tubers, rather than just contrasting lines. This is a high-yielding orange oca originally from the collection of Föreningen Sesam –the "Swedish society for seed propagation and protection of cultural plants". It seems to do really well, making decent numbers of orange tubers, slightly lighter towards the tip. A really excellent pale pink oca from the collection of Frank Van Keirsbilck, who got it from New Zealand. This one yields very well, with pretty tubers, and a large average tuber size. Easy to dig as well, with the tubers clustered close together. The tubers are a very attractive dusky pink, with lighter white patches, and consistently good production. A bright red strain that we have grown for many years. It makes beautiful tubers with pure white outlines over the eyes. We've done a lot of selection on this one and we're really pleased with the results. It gives good even sized tubers, nicely close into the plant for harvest. This interesting oca was sent to us in 2007 by Dylan Keating, who we think got them originally from his brother in Peru. We received two and a half (!) tiny seed tubers from Cornwall, but they grew, and we have slowly been building up our stocks ever since. 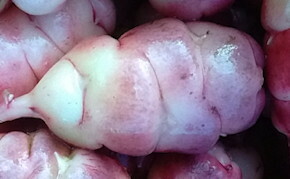 This variety makes consistently large and even shaped tubers, in a pretty creamy yellow with red markings around the eyes. They're a slightly different shape to our other varieties, smooth and more egg shaped, and very, very pretty. This is a dark red Oca variety that was given to us in 2004. 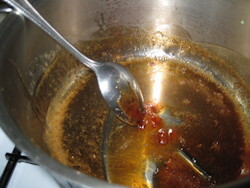 It is dark red all over - no white bits - and does really quite well for us. 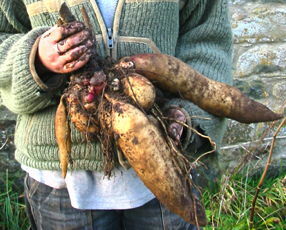 It had been grown for several years in Wales before we got it and makes good sized tubers with not too many tiddlers. A good choice for a decent yield and very pretty tubers. A very pretty new light yellow and red oca which we introduced in the 2016 catalogue. Isn't it nice? The tubers are a good shape that washes clean easily. Bred by us in Wales. This was selected from one unusually-coloured tuber Ben spotted on a plant of bicolor oca back in 2012.
at least 6 different varieties. Note! These tubers will be smaller than in the single variety packs - we choose smaller ones so we can include more different types. People write to ask what varieties they'll get, but we can't say, it just depends on what is to hand. NB: All the mixed bags packed at a particular time have roughly the same mix of tubers in them, so if you bought 2 bags you won't get any extra varieties, you'll get two lots the same. Not strictly an unusual tuber, but a very useful plant to have in your garden all the same. 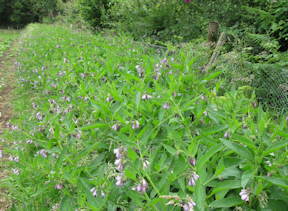 Comfrey is a fantastic resource for organic gardeners; incredibly hardy, quite shade tolerant, and excellent at scavenging nutrients from deep down in the soil and producing large amounts of top growth that you can cut several times per season. You can mulch with it, compost it, but probably the best single use is rotted into a liquid plant food ideal for tomatoes and many other high value crops. We supply you with three crown cuttings. These will establish quickly and can then be divided further in future seasons. 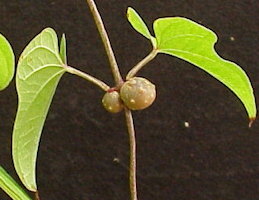 Three small crown cuttings as pictured. Pot up on receipt then plant out into the garden once established.